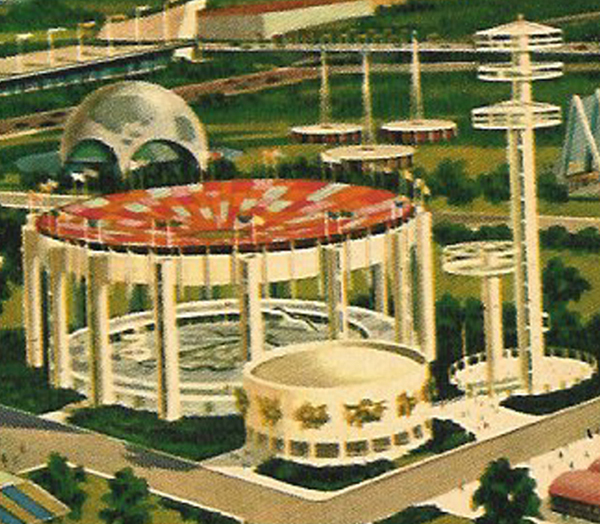 Looming over the New York State pavilion are three observation towers, one of which is the tallest structure at the fair (226 feet). Beneath the towers is the Tent of Tomorrow, the world’s biggest suspension roof (it is larger than a football field), supported by sixteen 100-foot concrete columns. Translucent colored panels in the roof flood the interior of the tent with colors. On the main floor, Texaco Oil Company has made a mammoth map of the state in terrazzo. Around the map are a number of impressive attractions, including an exhibit by the New York State Power Authority, a fine arts museum, fashion shows and a restaurant. On the mezzanine, visitors have an opportunity to meet state legislators. Next to the Tent of Tomorrow is the Theaterama, a large cylindrical movie theater decorated with controversial “pop” art. *Admission: free.